Baisha (白沙), or “white sand”, is named for the powdery white sand that decorates the surrounding countryside. It is part of the UNESCO World Heritage Site that Lijiang Old Town and Shuhe Town both belong to, yet somehow has managed to avoid the crowds and tourist traps that plague its two historic cousins. It has become a favourite haunt for those travellers who want to engage in an authentic cultural experience without having to force their way through throngs of tourists or suffer the swarms of souvenir vendors! With its many temples, rich cultural heritage, stunning frescoes and zany homeopathic doctors, Baisha is one of the many must-see attractions in Lijiang County. Baisha was the birthplace of the Mu clan, who were renowned for their skill and experience in city planning. They began expanding Baisha during the Tang Dynasty (618-907) and by the Song Dynasty (960-1279) it had blossomed into a thriving town. It remained the political, commercial and cultural centre of the local Naxi people for over 400 years. The Mu clan ingeniously channelled water from the Jade River into a canal system within the village to provide locals with fresh water. This waterway system, coupled with the village’s beautifully preserved architecture, is what cemented its status as a World Heritage Site. During the Yuan Dynasty (1271-1368), the Mu clan were demoted by the Emperor to “Tusi” or chieftains, as oppose to rulers of the region. By the Ming Dynasty (1368-1644), they had moved their base of operations to Dayan Town (modern-day Lijiang Old Town) and Baisha became their religious centre. Like Dayan, Baisha played a focal role as a trade hub along the ancient Tea-Horse Road. The local Naxi women were known for their exquisite silk embroidery and this precious export allowed the town to prosper and grow. This Naxi tradition carried on until 1972, when it was banned during the Cultural Revolution (1966-1976). Many of the Naxi embroidery masters were imprisoned and tragically died in jail. The art was later revived and now thrives thanks to the Baisha Naxi Embroidery Institute. 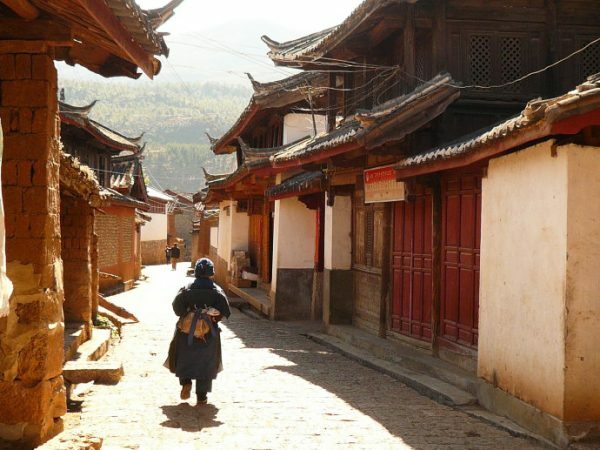 Nowadays, the village serves as the ideal place to learn about Naxi culture and ancient Buddhist history. In the central district of the village, there are a group of temples known as “Mudu”. Many of them boast access to the stunning Baisha Frescoes, of which there are only 55 still in existence. While the frescoes are scattered throughout villages in Lijiang County, the vast majority of them can be found in Baisha. They are religious paintings reflecting famous stories from Buddhism, Tibetan Buddhism and Taoism. What makes these murals so unique is that they were painted by artists from the Han, Naxi, Tibetan and Bai ethnic minorities, meaning they are a mixture of ethnic styles. Imagine how much a painting by Salvador Dali and Pablo Picasso would be worth, and you get the idea! Dabaoji Palace was built by the Mu clan in 658 AD and houses 28 of these fresco groups, featuring over 100 religious figures from various tales. They date all the way back to the Ming Dynasty and are so delicate that the flash of a camera could potentially damage them, so it goes without saying that photographs are unfortunately off-limits. The remainder of Baisha’s frescoes can be found in Dading Pavilion. The pavilion itself was built in 1572 but most of its 16 mural paintings date back to the Qing Dynasty (1644-1912). You won’t be able to take a memento of the frescoes with you but, if you want a beautiful souvenir, you need go no further than the Baisha Naxi Embroidery Institute! This institute was established with the aim of reviving, protecting and passing on the skill of Naxi handmade embroidery. Here Naxi embroidery masters are free to carry on this majestic art and pass their skills on to the next generation. Some Naxi embroidery masters will spend years working on a single project. One of the masters was even commissioned by Xi Jinping, the General Secretary of the Communist Party, to embroider a portrait of President Obama and his family, which was then presented as a gift. The students sell their work for around 250 yuan each (about £25) but work by the grand masters can go for thousands of pounds! However, by far the most fascinating resident is Dr Ho. He’s currently 93 years old and has achieved international fame as a practitioner of ancient Chinese medicine. His clinic is plastered with newspaper articles about him, including pieces by the BBC and National Geographic. He’s fluent in English and will happily treat any ailment with his homemade herbal remedies or just talk to curious visitors about his work. His motto is “optimism is the best medicine” and, looking into his sagacious, smiling face, it’s hard to disagree! If you fancy a longer stay, there are a handful of hotels in the village that vary in quality and price. Around the village, there are a plethora of cycling trails that provide access to temples, natural hotspots, and other charming villages. The streets are littered with stalls selling Tibetan craftworks, Naxi embroidery, and t-shirts hand-painted in either Tibetan script or the rare Dongba script. Some of the best Naxi-style cuisine can be found in Baisha, as it is a paradise of restaurants and small eateries. You’ll even find a few Western-style restaurants and cafés dotted about its ancient streets. A rural paradise where you can still get a good cup of coffee; what more could you ask for? Dongba Script: The written language of the Naxi ethnic minority. It is the only known hieroglyphic writing system still in existence.